The three-block stretch of Clark Street between LaSalle Drive and Armitage Avenue appears to be a hidden treasure for locals and visitors alike: With no residency restrictions and the ability to “pay” meters remotely, local residents and hotel guests can park their cars for the night on a busy street and save a lot of money compared to local garage and valet rates. But these thrifty drivers overlook the piles of broken auto glass beneath their feet at their own peril. Following up on tips from local residents, CWBChicago found police records that show nearly 200 auto break-ins have been reported on the short stretch of Clark Street since Jan. 2018. Given that such incidents often go unreported to police, the actual number of break-ins is certainly much higher. Heat map showing auto break-in concentration Jan 2018 - March 23, 2019. 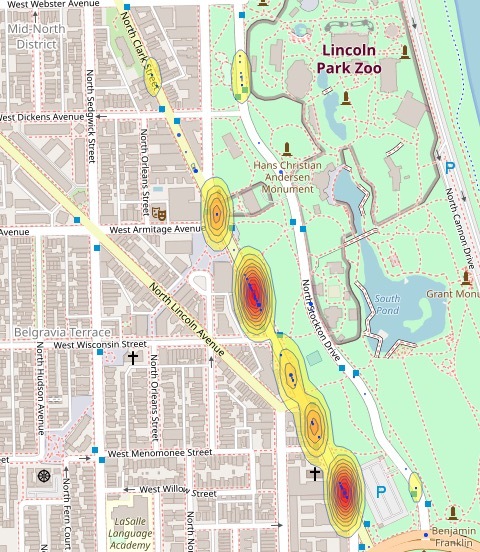 A heat map of auto break-ins, compiled using Chicago Police Department report data, shows two red-hot vehicle burglary zones on Clark Street while hardly any similar cases have been reported just a few yards east on Stockton Drive. The thieves almost always work the east side of Clark Street, on the edge of the neighborhood’s namesake park where foot traffic is low. Break-ins are so common, you can see piles of broken auto glass on the sidewalk via Google Streetview images. Piles of blue auto glass mark the scenes of Clark Street vehicle break-ins on Google Streetview. Two weeks ago, something especially unusual happened: Someone saw an auto break-in happening on Clark Street and police arrived in time to arrest the alleged offenders. Just before 3 p.m. on March 19th, a contractor saw 45-year-old Brian Rodgers and 52-year-old Louis Banks break into a co-worker’s van in the 1700 block of North Clark, police said. Police arrested the two men minutes later near Clark and LaSalle Drive. Each man is charged with felony burglary and felony possession of burglary tools. Rodgers, a three-time convicted burglar, was released early from prison on Nov. 26 after serving half of a seven-year sentence for burglary, according to state records. His previous prison sentences include three years for possessing a stolen motor vehicle in 2010; 36 months for burglary in 2007; one year for narcotics in 2006; and 44 months for burglary in 2006.